What we dont like to see on Friday at noon during a heat emergency is a visit from the cemetery manager telling us of a dangerous tree issue. Had to call in Gamma tree to bring it to the ground safely without destroying the fence so the staff can then clean up after morning duties. Last season, a number of sinkholes developed in the lawn area just below the spillway on #9 down to the main road bridge. We used our backhoe to dig up the area and found that the 15" drain pipe was leaking a rather large amount of water underneath the pipe. The hole still remained in the lawn and I told the staff to dig up the line to see the complete issue. Skip dug up the line and found multiple failures up and down the line. The complete bottom of the pipe had rusted and was separated from the rest of the pipe. Around 160' in total length. The water that uses this line should be going to the small lake in front of #10 red tee box and ultimately flow into our irrigation lake. Some of the water was making it into the lake but a lot of water was soaking into the ground creating additional sinkholes and possibly compromising the footings in and around the bridge on the main road. We are currently digging up this line and will be replacing it over the next few days with dual walled hdpe pipe which will last past our life times. We had to cross over 2 small lines and luckily an 8" main went under the pipe. Also, a number of wire bundles had to be exposed to prevent them from being damaged. More pictures to follow. Failed pipe that was leaking over flow water from #9 lake. 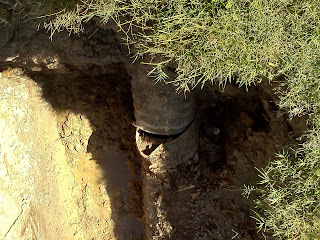 Additional issues throughout the full length of the pipe. 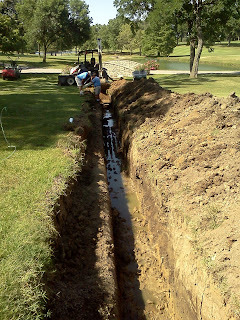 A 2" new irrigation line was pulled through the pipe during the installation in 2007. Also, complete bottom of the pipe was rotten. I sent this message through the club email system but thought I should repeat it on the blog. We have contracted with E&E Enterprises to Hydroject our greens on Tuesday, June 26th. They will arrive here at 5:30 a.m. with three machines and should be completed by 10:00 a.m. We have a route setup to reduce any conflicts with our members who will tee off after 8:00 a.m. This process uses a stream of water at 3000 psi emulating a needle tine venting that we do with our verti-drain machine. The holes are less than a 1/4 in diameter, 4-5" deep and 3" apart. This process allows oxygen to enter the green profile and carbon dioxide to move out of the rooting area. It also allows moisture to penetrate more freely into the root zone and will also allow wet areas to become drier. We will roll the greens after each green has been completed. This a non-evasive process that should have little impact on ball roll. Within a couple days there should be no visible sign of the process on the surface of the greens. We have a second venting scheduled for Monday, July 16th after The Invitational. For additional information, click on the link below to see the work that has been completed in the past using the hydroject machines. One of our large area rough mowers had a large hydraulic hose leak at the right side bottom of the rough along #13. 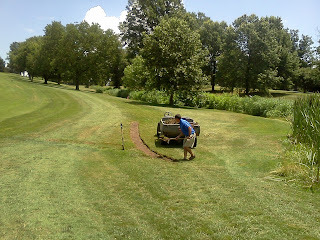 The leak was enough that we need to remove the old sod and replace it with some sod that we had near the green nursery. Usually, a narrow leak will heal itself pretty quickly and we will leave it alone but this leak was a foot wide or more in the area where it blew. Even though I do not like to add bermuda back on the golf course, it is the only thing that could possibly survive being laid at this time of year. Tom removing the sod at the bottom of #13. 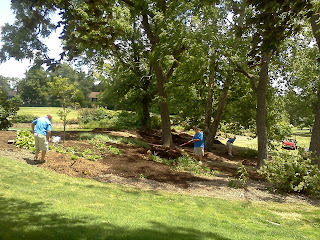 The staff have spent parts of the last week mulching the large ornamental bed around #9 lake. The mulch that was used came from oak tree limbs that were removed from the property over the last year. Becky has improved the planting on the tee side of the lake and it is beginning to fill in as the plants begin to grow. Jason, Jeff H, Joe, and Nick were working on this area today. The staff core aerated the warm season tees with coring tines on our verti-drain aerator. The cores were picked up at the end of each run. The tees were then dragged with a screen drag, blown off and then mowed. The 1.5" of rain over the last 10 days helped with softening the tees. We will do a solid tine deep aeration in the next week or two to help us with deeper water penetration into the tees. I was blowing leaves off of the fairways this morning which gave me some time to think about my father. He has been gone 20 years now, sometimes it seems like forever and other times it was just yesterday. 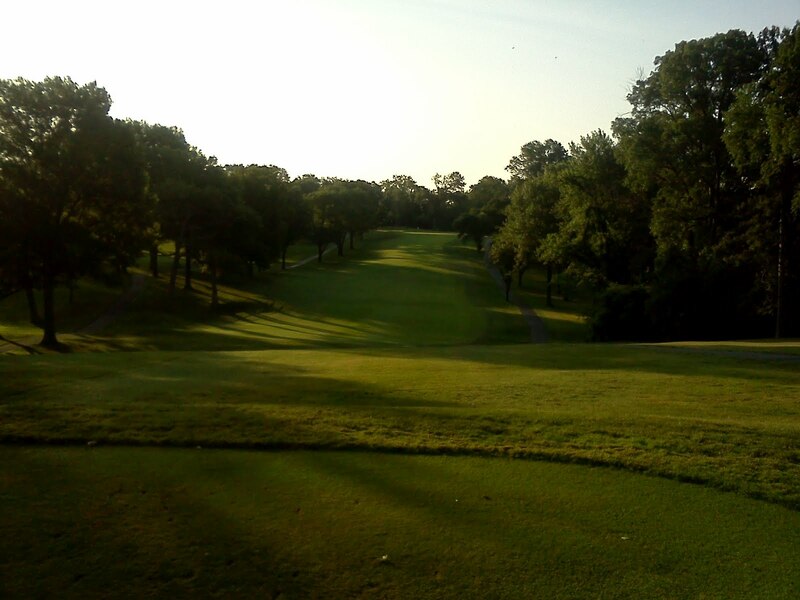 He would have loved driving up and down the fairways, watching the sun come up on a beautiful June morning with me here at Glen Echo. He gifted his four sons with a love of the outdoors. Dad had the opportunity to play Glen Echo in a superintendent fundraising tournament in 1990 with Superintendent brother Ed and myself. Overhearing a conversation about a job opening during dinner led me into this great profession three weeks later when I was hired as an assistant superintendent at Sunset CC and have never looked back. My dad was a great man. I was given great memories and lessons about life from him. I miss him. 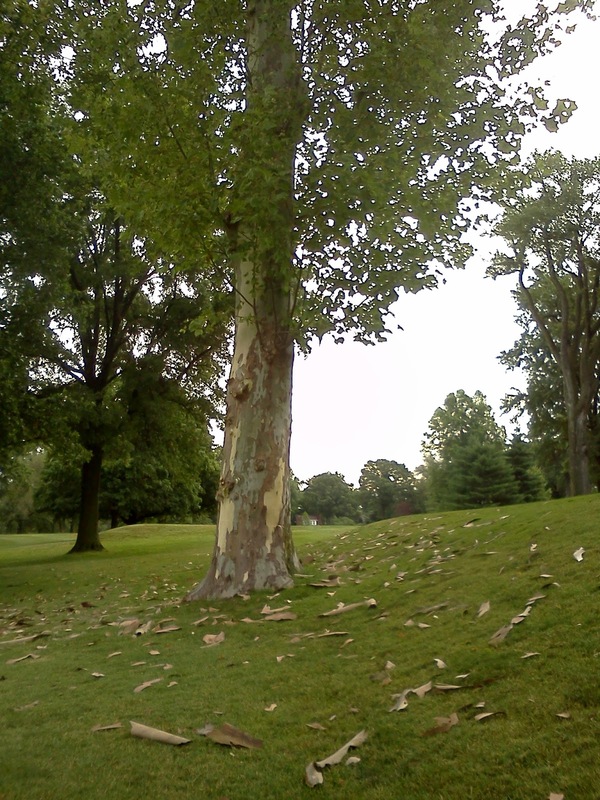 The 5th tee and area was littered with Sycamore bark that has been shedding over the last couple of days and was accelerated during the rainstorm last night. A nice .52" of rain by the way. The first paragraph in the link below explains why these trees are not able to hold onto their bark like other trees. US Open Setup Today, Why not have some fun! I can't match the monster at Olympic they've created this week in SF but we will have a good test for you today at Glen Echo. Have fun! We received our first substantial rainfall on Monday June 11th of .95. We had only received .15" of rain since May 5th which was creating a number of issues for our turf and facility. We base our water budget on historical data. We were under budget for the fiscal years ending at the end of March in both 2009, 2010,and 2011. 2012 showed a marked increase in our water costs of nearly 20K over budget due to the prolonged dry period in July/August of last summer. Our rainfall for May has all but dried up and our temperatures were at least 5-6 degrees above normal, not a good combination. If our irrigation system is set at just average levels of use and all of our heads are turned on, we can apply up to 300,000-400,000 gallons a night. We do not manage our system that way. In an effort to manage both the cost of the water we apply as well as being good environmental stewards of our water use, we limit some areas from receiving water on a regular basis. Our hope is that we receive an inch of rain a week which usually keeps these areas looking good. We keep the middle of our course watered on each hole. Basically, the tees, fairways, first cut of rough, greens and surrounds. We also water our flower beds every other day and the areas within the close proximity of the clubhouse. Our outer rough heads between holes are used every other day and we only use about 1/2 of these rough heads on any given night in a hope that rain will fall. In the last few days as our water usage continued to increase, we began to shut off some heads off of the tees and reduced the deeper rough completely. Our usage this billing cycle is up 400% from our budget number of $ 5K. We have been running nightly cycles that you would normally see in the middle of July. Our efforts to improve our water use includes using wetting agents and water penetrants which will improve out water holding capability and water penetration into the soil. We have completed applications on tees, greens and some select green surrounds. We will probably begin to make applications to all of our greens surrounds and fairways to improve our water's ability to get to our turf's roots. Our trend for the summer is not looking good after this past cycle but as you know with weather, that can change very quickly with some timely rain. 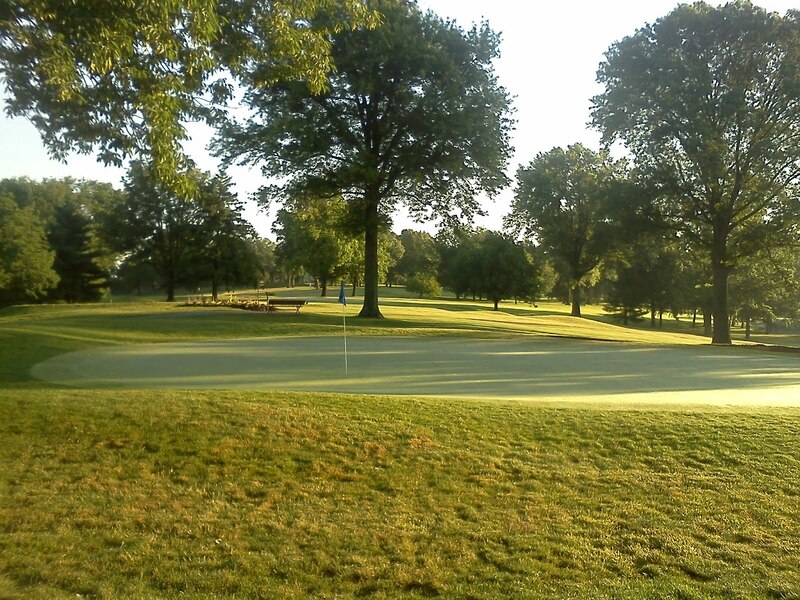 Our goal is to have healthy turf by using enough water to keep the turf in our main play areas active and growing. Emerald green everywhere does not fit into the budget that we have to manage and does not make for a golf course that plays well. It is also not the healthiest way to grow grass. Moist, wet conditions provide for poor playing conditions and increase and encourage turf damage from play and increases the potential for disease. 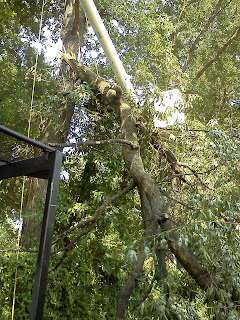 Rain from a previous storm in 09. I wish our lakes were full. Reduce thatch build up in the zoysia. Improve water penetration which makes for a better playing surface but at the same time slowing water penetration in the small reservoirs created by the aeration holes..
Reduce compaction of the tee allowing a tee to enter the ground more easily. Improve gas exchange with oxygen entering the soil and carbon dioxide leaving the soil. Improved root growth in the aeration holes. 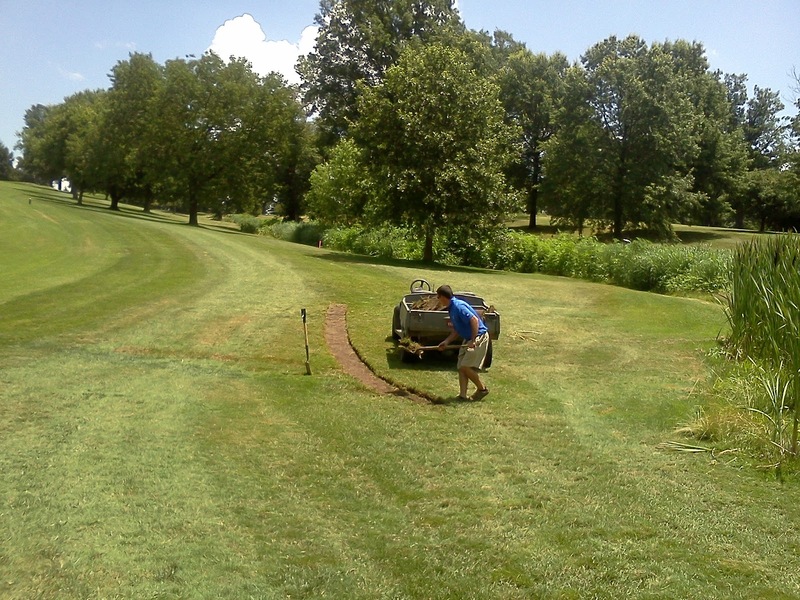 During the last few weeks, the staff completed a great deal of work on the fence lines of #1, 2, 3 and 4. They had become overgrown with poison ivy, grape vines and other junk trees. Some of the areas had grown out 3' or more away from the fence line. Many piles of brush were hauled off and the area now along the fence line will allow you to locate an errant shot along the fence. I know some would like to hide the course from the outside world but our goal was to keep our side of the fence clean. Removing the material when it is smaller size is much easier than allowing the growth to become too large. The poison ivy also creates issues for not only our golfers but also our staff who are allergic to the fast growing weed. Interview with Pat Finlen CGCS who is responsible for the Course Maintenance at the Olympic Club. Pat spent a great deal of time in the Kansas City area. Blog from Golf Course Management magazine which would be interesting to follow this week. It should be a near perfect day at Glen Echo today! Everything will be trimmed up and last minute details will be tended to by the staff. I know Chef Rob has a great shrimp boil lined up tonight in the clubhouse. Mmmmm SHRIMP! The patio should be packed. COME OUT AND JOIN US TONIGHT OR THROUGHOUT THE WEEKEND!